Make a beautiful statement (in more ways than one!) 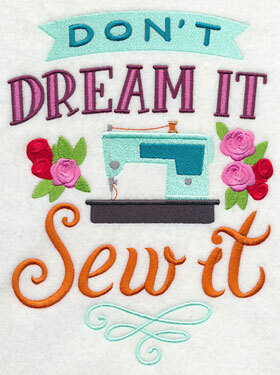 on your next embroidery project with these stunning designs! 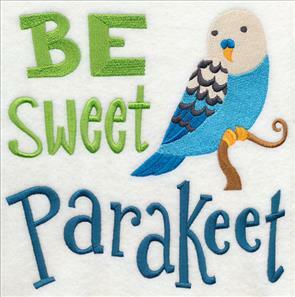 Sweet quotes and sayings inspired by home, family, crafting, and more are fabulous additions to a wide variety of projects. 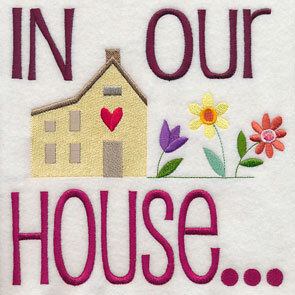 Stitch an intricate "Family" motif on a pillow or tote bag, or adorn a quilt with new "In Our Home" designs. 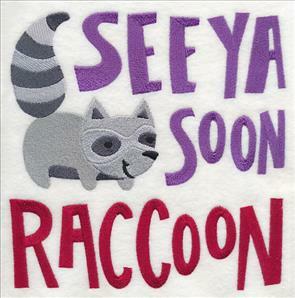 Plus, crafty quotes, kid-friendly designs, and more! Stunning colors, florals, and other elegant accents bring a whole new look to these beautiful word designs. 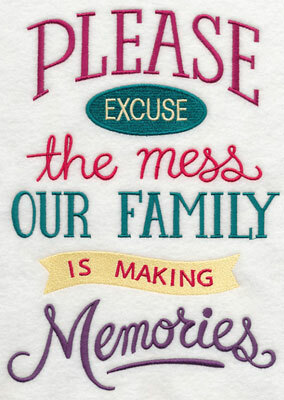 "Home" and "Family" are gorgeous on pillows, framed pieces, wall hangings, and more. 9.28" x 4.61" and 7.40" x 3.68"
10.58" x 4.90" and 8.46" x 3.92"
6.98" x 3.24" and 6.13" x 2.84"
Variations of these detailed, exquisite designs read "Blessed" and "Love" and are beautiful additions to your home decor. 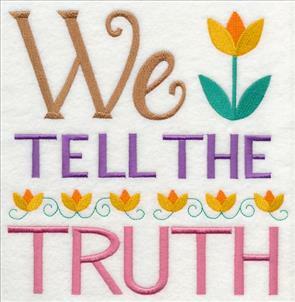 Add to tote bags to share what's important in life wherever you go; they're beautiful in quilt blocks, too! 11.74" x 5.44" and 9.40" x 4.36"
9.33" x 4.70" and 7.44" x 3.75"
6.16" x 3.11" and 5.40" x 2.72"
Celebrate your love for all things crafty with new creative sayings and samplers. 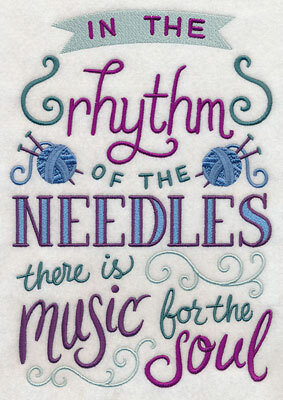 The use of bold color, varying fonts, and sweet accents give these designs fabulous eye-catching appeal. 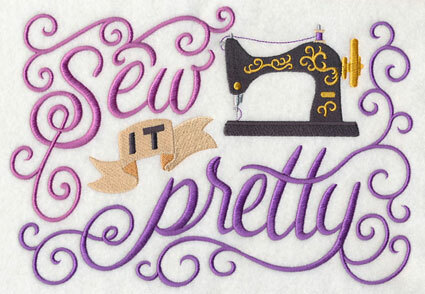 6.90" x 9.16" and 5.86" x 7.78" and 4.86" x 6.45"
Whether you're a sewing aficionado or a knitting enthusiast, there's a saying for everyone! 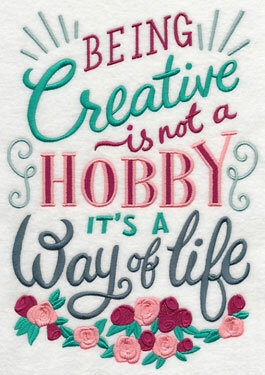 The lively designs are fabulous for shirts, totes, and framed art to brighten up your crafty space. 6.90" x 9.93" and 5.85" x 8.42"
5.32" x 7.66" and 4.78" x 6.89"
6.88" x 9.75" and 5.50" x 7.80" and 4.84" x 6.87"
Get inspired to start sewing your next project with these fabulous designs. 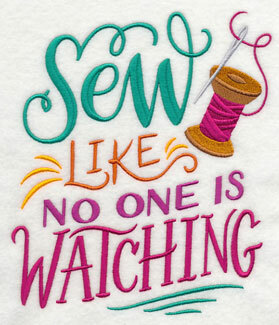 Add a "Sew Like No One is Watching" design to a tote bag, or stitch "I Love You Sew Very Much" on a pillow. 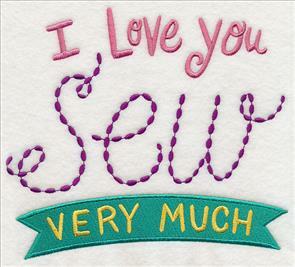 Great for presents for sewing and crafting groups, too! 6.49" x 7.80" and 5.85" x 7.04"
7.81" x 6.87" and 6.67" x 5.86"
5.53" x 4.86" and 3.86" x 3.40"
Elegant filigree and text paired with an antique sewing machine makes this "Sew it Pretty" design a sophisticated addition to pillows and machine covers, too. 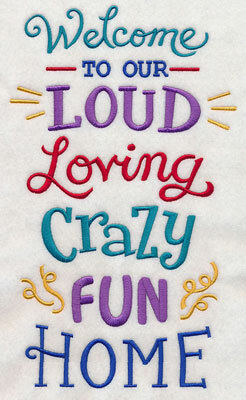 9.88" x 6.90" and 7.80" x 5.45" and 6.86" x 4.80"
Home-inspired sayings bring the best things in life to your embroidery machine! 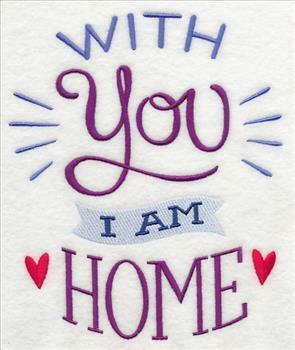 Add a "With You I Am Home" motif to bed linens or hang a "Welcome to Our Loud, Loving, Crazy, Fun Home" wall hanging right inside your front door. 6.56" x 7.82" and 5.85" x 6.98"
6.90" x 11.64" and 5.58" x 9.40"
4.63" x 7.80" and 4.06" x 6.85"
Dress up your kitchen towels with patterned fabric, uplifting embroidery, and a handy hanging loop! 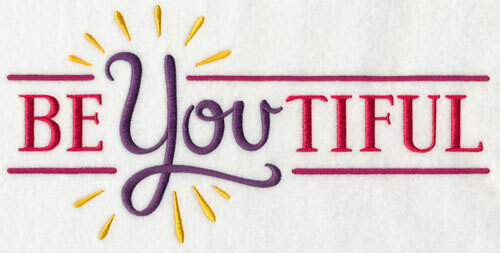 Free project instructions for whipping up this colorful towel can be found right here. 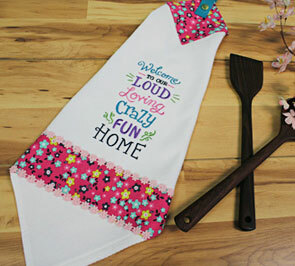 Tea and bath towels, aprons, tote bags, and wall hangings are a delightful home for these sweet sentiments. 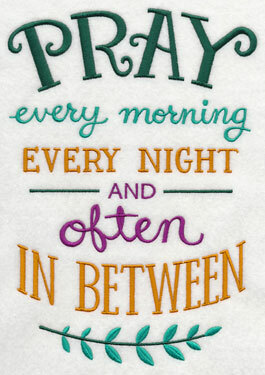 Stitch the words of wisdom to dress up your everyday decor. 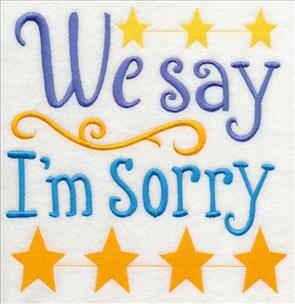 6.84" x 9.74" and 5.47" x 7.80"
6.90" x 9.39" and 5.73" x 7.80"
4.84" x 6.59" and 2.98" x 3.87"
Never apologize for a messy house again! 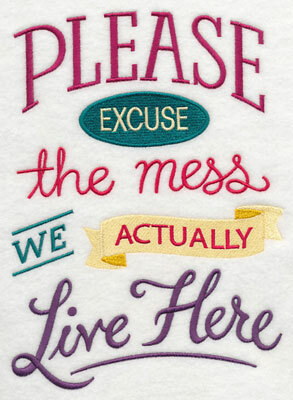 These "Please Excuse the Mess" designs are witty additions to wall hangings, framed pieces, and pillows. 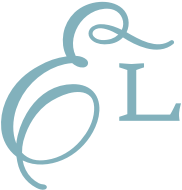 Two variations make it easy to personalize for your family's style and preference. 6.85" x 9.50" and 5.63" x 7.82"
6.86" x 9.37" and 5.72" x 7.82"
4.85" x 6.62" and 2.83" x 3.87"
Brighten your home with a bright and cheerful message on tea towels, pillows, placemats, and more! This "Be-You-Tiful" design is a gorgeous way to start your day. 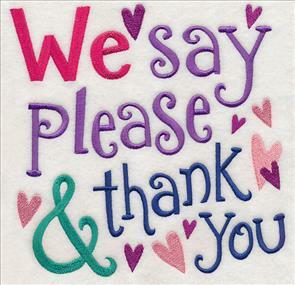 11.75" x 5.82" and 9.40" x 4.65" and 7.80" x 3.86" and 6.85" x 3.39" and 3.85" x 1.91"
Share your house rules on a quilt or wall hanging with these sweet sentiments! 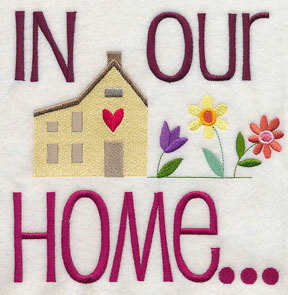 Designs for both "home" and "house" gives you the opportunity to pick which fits best for your family. 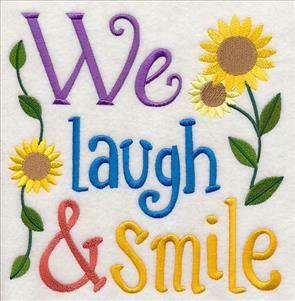 7.80" x 7.81" and 6.85" x 6.86"
5.86" x 5.87" and 4.85" x 4.86"
In our home, we laugh and smile; we give hugs and kisses. 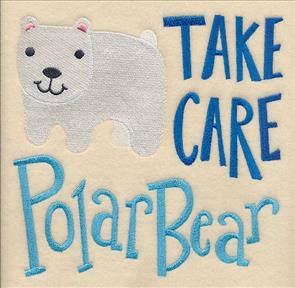 Not only are pillows, quilts, and framed art a meaningful way to decorate your home with these designs, but they're terrific for giving to friends and family as well. 7.81" x 7.81" and 6.85" x 6.85"
7.81" x 7.81" and 6.91" x 6.90"
Pick your favorites from these "In Our Home" designs, and whip up a matching pair of pillows. They're terrific displayed on a couch, bench, or guest bed. 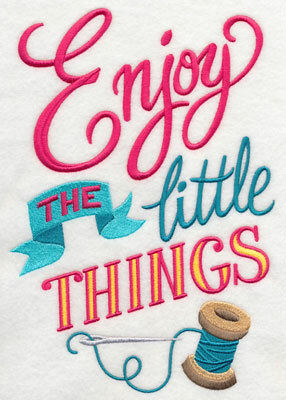 Stitch the darling squares as daily reminders of the important things in life. 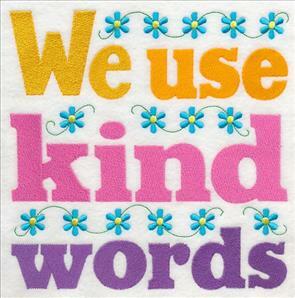 Kind words and saying "I Love You" are brilliant for encouraging your family to bring joy and love to every day. Each of the squares have been designed differently to stand out on their own, while similar colors and styles offer a cohesive look. 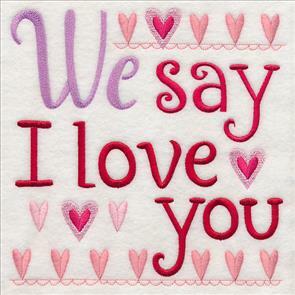 Flowers, hearts, and borders accent the messages on these designs. 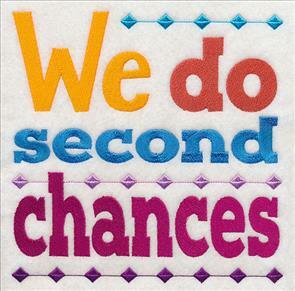 7.79" x 7.75" and 6.93" x 6.89"
5.88" x 5.86" and 4.89" x 4.86"
7.75" x 7.80" and 6.89" x 6.93"
Add these sweet words and sayings to throw pillows, aprons, and tote bags to bring their positive messages into each and every day. 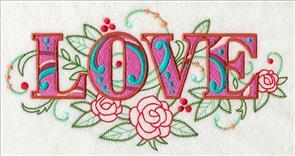 The various lettering and colors adds an eye-catching look to any embroidery project. 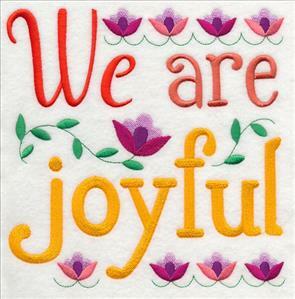 5.85" x 5.81" and 4.88" x 4.84"
7.80" x 7.79" and 6.87" x 6.85"
Not only are these quotes uplifting and affirming, but they're brilliant learning moments for kids, too. 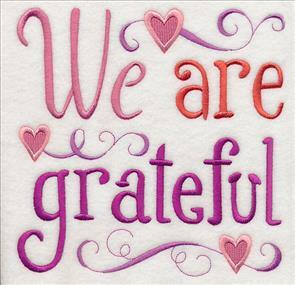 The two designs below offer a reminder to always tell the truth, and be grateful for the good things in life. 7.79" x 7.81" and 6.85" x 6.87"
5.84" x 5.87" and 4.85" x 4.87"
7.81" x 7.70" and 7.01" x 6.90"
5.96" x 5.87" and 4.93" x 4.86"
"We Do Second Chances" and "We Say I'm Sorry" are charming additions to mini-quilts, wall hangings, and more! 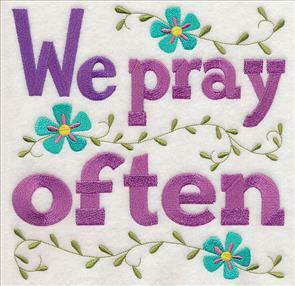 7.80" x 7.81" and 6.90" x 6.90"
7.78" x 7.79" and 6.84" x 6.85"
5.84" x 5.86" and 4.85" x 4.86"
Stitch these daily affirmations onto wall hangings, quilts, totes, and more. Order them singly by using the links above, or get them all in a design pack. 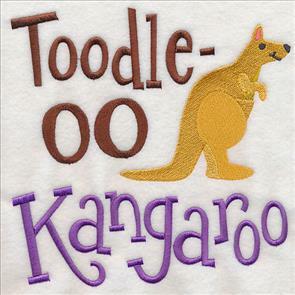 So long, farewell, toodle-oo, take care! 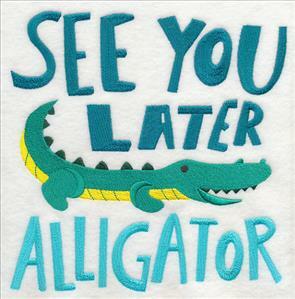 Say goodbye in style with these too-cute animal designs! 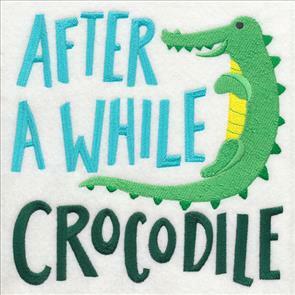 Inspired by the classic "See You Later, Alligator" and "After a While, Crocodile" quotes, these designs are a sweet addition to any embroidery project! 5.82" x 5.89" and 4.86" x 4.91"
7.80" x 7.75" and 6.96" x 6.90"
5.94" x 5.89" and 4.94" x 4.89"
Create a catch-all for toys and kids things with these charming designs. You can even make the tote reversible by embroidering one of the animal designs on each side! 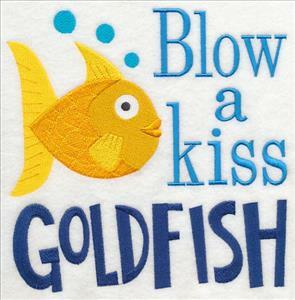 An adorable polar bear says so long, while a wide-eyed goldfish sends kisses your way. 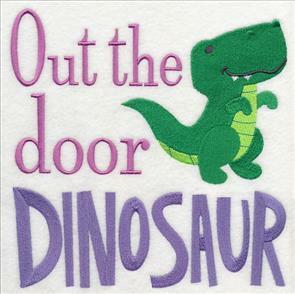 These designs are fabulous on pillows, kids gear, and tote bags. 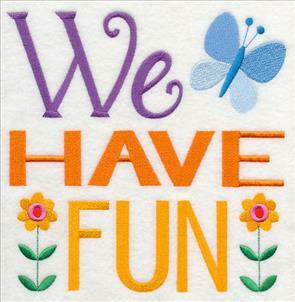 7.81" x 7.77" and 6.94" x 6.91"
5.86" x 5.83" and 4.84" x 4.82"
Pick your favorite of the friendly farewells, or stitch them all for a bright and colorful collection! 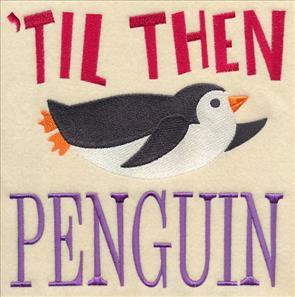 They're terrific used together on a quilt or series of framed pieces hung on a wall. 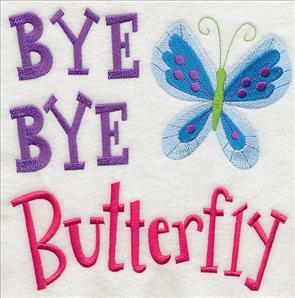 5.87" x 5.86" and 4.87" x 4.87"
A butterfly and a kangaroo say their goodbyes in this pair of designs. 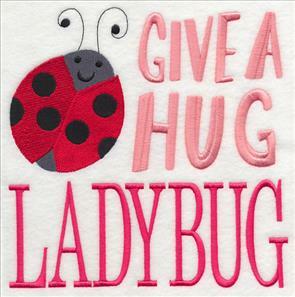 Stitch on a sweatshirt or jacket, baby blankets, or a pillow! 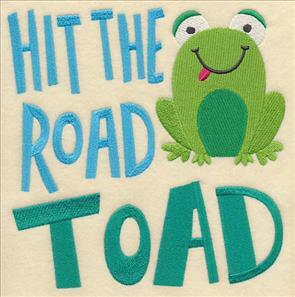 7.81" x 7.76" and 6.89" x 6.85"
5.90" x 5.86" and 4.84" x 4.86"
The bright colors and friendly characters on each of these designs adds lighthearted, kid-friendly appeal. 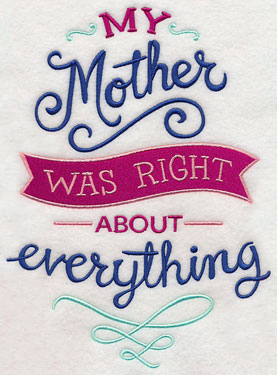 Baby showers, birthdays, and spur-of-the-moment presents all get a brilliant update thanks to these embroidery designs. 5.89" x 5.85" and 4.89" x 4.86"
7.81" x 7.80" and 6.92" x 6.90"
These darling square designs are great for embellishing tote bags, burp cloths, and other nursery decor, too! 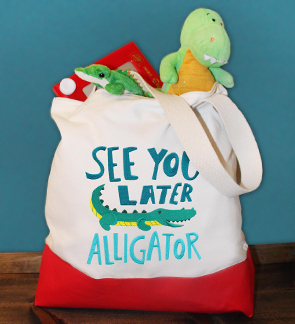 7.81" x 7.78" and 6.92" x 6.90"
5.88" x 5.86" and 4.86" x 4.85"
These cute and clever goodbye designs are just the ticket when adorning kids' gifts and projects. Mary Pat was looking through our dress form designs, and especially liked the Christmas and Halloween versions. She requested variations for other seasons and holidays, and we though it was a fabulous idea! 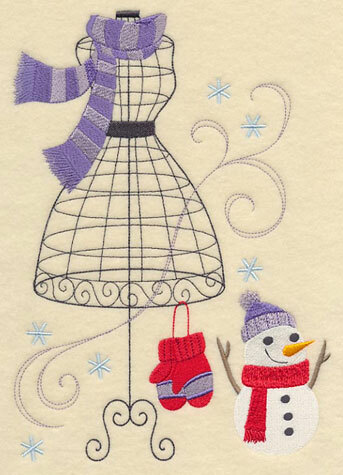 Here a dress form is ready to withstand the chill of winter with a scarf, pair of mittens, and adorable snowman friend. 6.87" x 9.68" and 5.85" x 8.24" and 5.30" x 7.47" and 4.82" x 6.79" and 2.80" x 3.89"